References DIM_none, AP_Dialog_Columns::getHeightString(), m_Dim_MaxHeight, m_dlg, AP_Dialog_Columns::setMaxHeight(), UT_ASSERT, UT_determineDimension(), and UT_dimensionName(). References DIM_none, AP_Dialog_Columns::getSpaceAfterString(), m_Dim_SpaceAfter, m_dlg, AP_Dialog_Columns::setSpaceAfter(), UT_determineDimension(), and UT_dimensionName(). References checkLineBetween, AP_Columns_preview::draw(), m_dlg, AP_Dialog_Columns::m_pColumnsPreview, and AP_Dialog_Columns::setColumns(). Referenced by colNumberChanged, and runModal. References AP_Dialog_Columns::getHeightString(), AP_Dialog_Columns::incrementMaxHeight(), and m_dlg. References AP_Dialog_Columns::getSpaceAfterString(), AP_Dialog_Columns::incrementSpaceAfter(), m_dlg, and AP_Dialog_Columns::setSpaceAfter(). 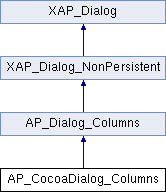 References AP_Dialog_Columns::_createPreviewFromGC(), DELETEP, DIM_none, event_Toggle, XAP_App::getApp(), AP_Dialog_Columns::getColumnOrder(), AP_Dialog_Columns::getColumns(), AP_Dialog_Columns::getHeightString(), AP_Dialog_Columns::getLineBetween(), AP_Dialog_Columns::getSpaceAfterString(), m_Dim_MaxHeight, m_Dim_SpaceAfter, m_dlg, m_pPreviewWidget, XAP_App::newGraphics(), AP_Dialog_Columns::setColumnOrder(), AP_Dialog_Columns::setLineBetween(), AP_Dialog_Columns::setSpaceAfter(), AP_Dialog_Columns::setViewAndDoc(), size, and UT_determineDimension(). Referenced by doMaxHeightEntry, and runModal. Referenced by doSpaceAfterEntry, and runModal. Referenced by checkLineBetween, colNumberChanged, doMaxHeightEntry, doSpaceAfterEntry, event_Toggle, incrMaxHeight, incrSpaceAfter, and runModal. Referenced by runModal, and ~AP_CocoaDialog_Columns.